When discussing music production software, presets, and plugins, one of the names that are usually at the top of the list for must-haves is Slate Digital. If you don’t know who Slate Digital are and work in music production, you’ve almost definitely worked with one of their products before. Slate Digital is a young brand in the music production category, having only been founded in 2007. The company mission at the time was to create the most high quality digital audio tools possible for use in production, mixing, and engineering. In the decade since then, Slate Digital has attracted some of the biggest names in music production to their brand including Chris Lord-Alge, have launched free tutorials online, launched music production and mixing courses, and have a number of amazing plug-ins available at very affordable rates. Slate Digital has received rave reviews from many in the industry but are Slate Digital plugins really as good as people say they are – well, yes and no. For any engineer or producer, the best way to test whether Slate Digital plugins appeal to you is to try them. From our experience, Slate Digital makes some seriously high quality plugins and compared to other brands, they’re offered at very competitive and affordable pricing. In the production industry, one of the big brand battles happening is Slate Digital v. Universal Audio. Though Universal Audio makes some awesome, amazing stuff, they tend to be priced slightly higher than Slate Digital so this bears keeping in mind if you’re on a budget. Thus, our recommendation comes to first check out the selection of plugins available via Slate Digital and then try out some trials to get a sense on if it’s a fit. If you’re worried about plugins sounding dated or not being able to keep up with hardware developments down the line, Slate Digital’s selection is very modern and are not going to go out of style anytime soon. The latest on what Slate Digital has been pushing is their ‘All Access Pass’ priced at $14.99 a month. This is also known widely throughout the industry as the ‘Everything Bundle’. For any engineer or mixer just getting going with Slate Digital, this bundle of plugins is the ultimate. To pay yearly upfront, a one-year subscription to Slate Digital’s plugins are valued at $179.88. This is actually a pretty good deal when you consider that you will receive every single Slate Digital plugin they make in addition to a small collection of third party plugins as well. Even better, when Slate Digital releases new plugins down the road, you get those as well at no extra charge. 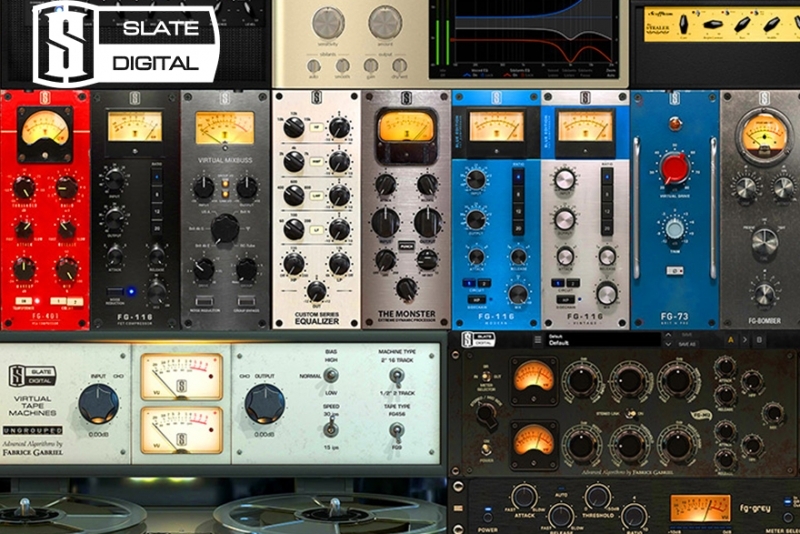 The Slate Digital plugins we recommend giving a spin from this bundle include the FG-Stress, FG-Bomber, FG-401 VCA Compressor, FGX-Mastering Processor, VTC London, Virtual Buss Compressors, and Trimmer. All things considered, Slate Digital are ideal for smaller to mid-size studios and/or those who are on a budget and need to save where they can. Slate Digital mixing plugins are as good as anything else in the industry, emulating analog gear in ways that lesser brands can’t. The closest comparison are with UAD plugins and a select few other brands, though Slate Digital usually beats them on price.